Sing (Chow), who is a Mainland bumpkin and has supernatural powers, is exploited by his streetwise uncle (Ng Man Tat) to sweep stakes in the casino and finally wins the champion in the tournament of King of Gamblers. Setting its background at social grass-roots class, this movie illustrates the desire of teh common people to get rich without making any effort. 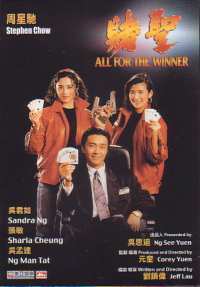 With the success of God Of Gamblers in 1989 it was inevitable that more films would attempt to cash in on its success. One of the films to do so starred a young rising star by the name of Stephen Chow, and that film would help certify him as one of the better comedy actors in the circuit. Few people could have told that he would go on to become possibly the biggest star in Hong Kong cinema within the next decade or so. So as I am dying with anticipation for his upcoming Kung Fu Hustle, I looked back at his gambling comedy All For The Winner. I must admit that I had heard quite a lot of good things about this film. 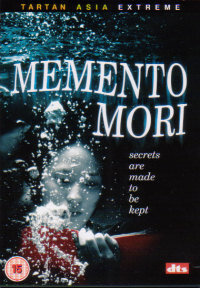 Part of this might just have been hype and anticipation due to the film being unavailable on DVD prior to this Mei Ah remastered release. After viewing the film I realise it must have been this as I found very little positive features in the film. I do realise that in humour there are cultural boundaries, so some things that are funny to Hong Kong people might not translate well in the West, but I've seen and liked a lot of other Stephen Chow comedies, so that can't be the complete reason for this one not hitting the mark with me. The problem I found with a lot of the humour was that a lot of it just seemed far too forced. When an audience is presented with a funny situation and it is portrayed naturally it will seem funny, but when the audience is basically told "Pay attention cause what is happening just now is funny, you will find it funny. Laugh! Look, this is funny, laugh!" the humour just doesn't propagate well. It wasn't just the forcing of the comedy that didn't go down well with me, some of the gags in the film just weren't funny, or if they were they were reused a little too much. The one that springs to mind is Ng Man Tat's character, Blackie, going a little crazy whenever Chow uses his full salutation in greeting him. It was very stupid looking and silly when it was first used, but it was used on many other occasions throughout the film, losing more of the little humour potential it originally had every time it was used. The film wasn't all bad though, as there were glimpses of the comic genius that Stephen Chow would become in the later years. The highlight would have to be his spoof take on Chow Yun Fat's slow motion God Of Gamblers entrance. I did laugh quite heartily at this scene and the humour felt all the more satisfying due to the lack of anything really funny prior to that point. There were some other decently funny points but alas nothing that appears to have been that memorable as I write this. The film isn't all about the humour though, as there are a few action set pieces as well. Fortunately these bring the film up a mark or so as they are quite good! Stephen Chow, Sharla Cheung and some other guy who's name escapes me pull of some good moves, making the fighting reasonably exciting and entertaining. Something that could have helped save the film a little was the gambling scenes. 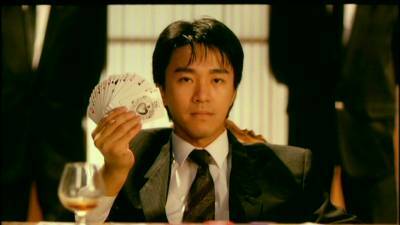 In God Of Gamblers and the many other gambling films I've seen like the Conman series the actual gambling has almost been as much of a choreographed event as a hand-to-hand fight, but here all opportunities are wasted. The climatic gambling match isn't exciting to watch at all as the tactics used in it do not lend themselves to being a visual spectacle. This is shame as in a film about gambling those scenes should be the main event. The film comes with three original language sound mixes - a Dolby Digital 5.1 or DTS mix, or the original theatrical audio track. I watched the film in DTS mode. The mix remains largely focussed on the front centre speaker with only ambient effects being noticeable in the rear surrounds and a few other effects in the front surrounds. The sound is reasonably clear, but on quite a few occasions of silence in the film the audio track actually sounds like it has dropped out. It hasn't really, I don't think, but the silence is dead silence, not even the sort of low level background noise or white noise that you normally get when hearing silence, but more the sort of silence you get when your sound system isn't even turned on. The subtitles are for the main part quite good. There are a few spelling errors and a few more grammar errors, but as happens far too often in Hong Kong DVDs, Chinese writing on the screen is not subtitled. The film print was pleasantly surprising. It was pretty clean with little in the way of grain. The colours were quite bold, but possibly could have been a little stronger. Detail levels were good, but not too sharp. 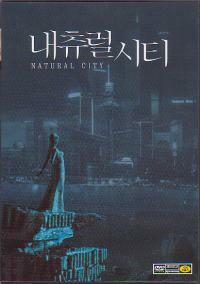 The DVD comes housed in an outer slipcase, that has become all the fashion with Hong Kong releases these days, but it still appears as though extras are not in fashion. There is only the film trailer, a trailer for Magic Crystal, the film's synopsis and a list of who's who in the cast and crew. Not that great really. For Stephen Chow completists All For The Winner is undoubtedly a film you'll want to see, but for people just looking for a good laugh, I'd honestly have to steer you in another direction. The film isn't that funny, despite containing one classic moment, and the gambling scenes are not the spectacle they should be. There is some decent action, but that is not nearly enough to save the film and merit it a watch.